~ These lights produce various effects such as spinning & moving beams, colour & shape changing beams. ~ LED lights have very low power consumption & this means that they require only a small power transformer making the unit very light weight. ~ They produce virtually no heat making them safer to work with. The "classic" oldest and most used effects but still as popular as ever. A simple but very effective compact light effect with a tough metal housing. Lamps respond to sound which is adjustable on the back of the unit. Supplied with your choice of coloured 60 Watt lamps, red, yellow, orange, blue, green, purple & white. The "classic" oldest and most used effects but still as popular as ever but now with LED Tecnology. 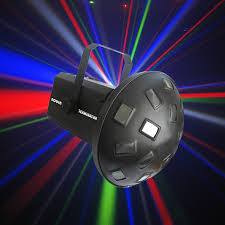 The LED's react to the beat of the music a simple but very effective compact light effect with a tough metal housing. The two halves of this effect clip together for transport. The lamps are wired in pairs & can be set to chase at adjustable speeds or to react to sound. The two units can be positioned up to 3 meters apart. A powerful but compact Moon Flower powered by a 3 watt LED, the light produces multiple sharp crisp beams of coloured light which flash & rotate back and forth together. 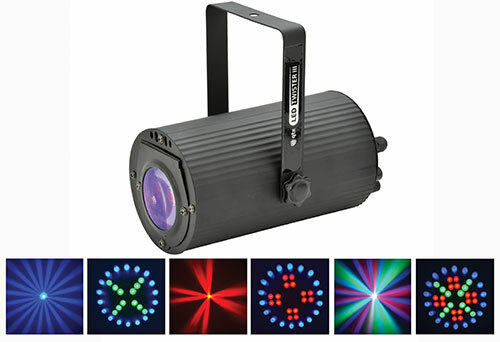 The unit features excellent built -in light shows & can be set to sound to light, master/slave & DMX mode where you can control the direction, speed , strobe & dimmer of the light. A powerful but compact Moon Flower powered by a 3 watt LED, the light produces multiple sharp crisp beams of white light which flash & rotate back and forth together. The unit features excellent built -in light shows & can be set to sound to light, master/slave & DMX mode where you can control the direction, speed , strobe & dimmer of the light. A compact but effective light fitted with red, green & blue LED's which produce an array of different coloured beams of light which rotate, flash & change in various sequences producing an interesting effect which looks good projected on or wall or through smoke or haze. A dazzling and very powerfull large moon flower producing an array of coloured beams that sway from side to side to the beat of the music. A dazzling and very powerful large moon flower which produces two contra rotating moon flowers with the outer flower producing coloured beams & the inside flower producing all white beams, the beams rotate back and for the opposite directions to each other to the beat of the music. This light projects various changing 3D gobo's arranged in a moon flower effect, the gobo's sway back & forth whilst slowly changing through various colours, the 3D illusion is perfect & the gobo's are sharp & bright. The unit is controlled by sound or a small hand held controller. This is a unique Kaleidoscope effect which projects masses of inter rotating patterns which change shape, colour & move back & forth at varying speeds. High quality optics, subtle colours & grate built in programs make the Alien out of this world. The unit responds to sound or can be controlled by a small hand held controller where specific patterns & speeds can be selected & held. 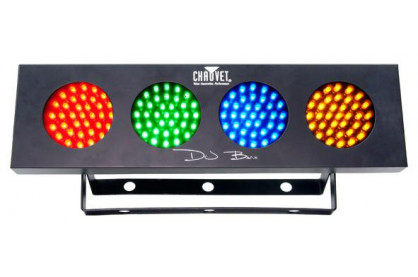 A compact but effective light fitted with red, green, blue & white LED's 52 in total which produce an array of different coloured beams of light which flash & change in various sequences producing an interesting effect which looks good projected on or wall or through smoke or haze. The unit features excellent built -in light shows & can be set to sound to light, master/slave & DMX mode where you can control the patterns, speed, strobe & dimmer of the light. A dazzling and very powerful large effect fitted with red, green, blue & white LED's 392 in total, the light which produces 7 large round clusters of LED beams of light, the 7 clusters each produces different effect which all combine together to produce an amazing effect which covers a very large area. The unit features excellent built -in light shows & can be set to sound to light, master/slave & DMX mode where you can control the 7 clusters individual patterns, speed, strobe & dimmer of the light. The light is fitted with red, green & blue LED's 46 in total, the LED's flash in various sequences & patterns while the barrel reflector spins back & forth sending the beams of light over a large area producing an good effect. The classic lighting effect now in LED with powerful light beams which will cover a large area, this light produces sharp multi-coloured chaning beams which rotate & chris-cross back and forth to the beat of the music. The sound response can be adjusted at the back of the unit. A stunning lighting effect with colour changing flat light beams which dance horizontally & vertically with the sound of the music. The sound response can be adjusted at the back of the unit. The VUE 6 is an extremely effective light which produces multiple multi-coloured groups of firework like projections which then rotate back and forth to the music. The units can be linked together in master/slave & can be controlled by DMX where the colours of the projections & moment of the beams of light can be fully controlled. This is a linked lighting system with 4 light units which run in synchronisation. The lights produce strong sharp multi-coloured gobo moon flowers which sequence, flash, chase & strobe to the beat of the music to from a complete light show. Each light unit contains 8 gobo's which can be manually set in each unit, so you can have a different show every time! The 4 lights are supplied with all connecting cables & a small remote blackout switch. Each light unit is powered by a 100 Watt Halogen Lamp.